One of my favorite things to do during the holiday season is look at lights! This year has been exceptionally fun since Miss H LOVES lights! We’ve made it a goal to go see a different light show every week of December. I was excited when we added the Brewery Lights to our list! We bundled up and off we went! The Anheuser-Busch Brewery is completely lit up with gorgeous lights! Once you are there, you can get a free wrist band for beverage samples along your walk. There are walking tours or you can just explore on your own, which is what we did! There are lots of fun things to do including a s’mores stations, pictures with the Clydesdales, food and more! If you are planning of making an evening of it, I’d recommend getting the Holiday Cheer Package which includes a food token, a tumbler and a commemorative photo. Kids are only $5 and get a s’mores kit. The clock tower was all lit up and gorgeous. There is something about the smell of a brewery that puts you in a good mood! There are so many options for beverages and great food. We had such a fun evening! Of course we had to have a family photo and a non-cooperating toddler. Miss H loved seeing all the lights and the Clydesdales! We took our nephew with us and he loved the s’mores of course. How cute did our commemorative photo turn out? Miss H thought the sleigh was so cool. You know, since it was Santa’s. There is still plenty of time to see the Brewery Lights between now and January 3rd! 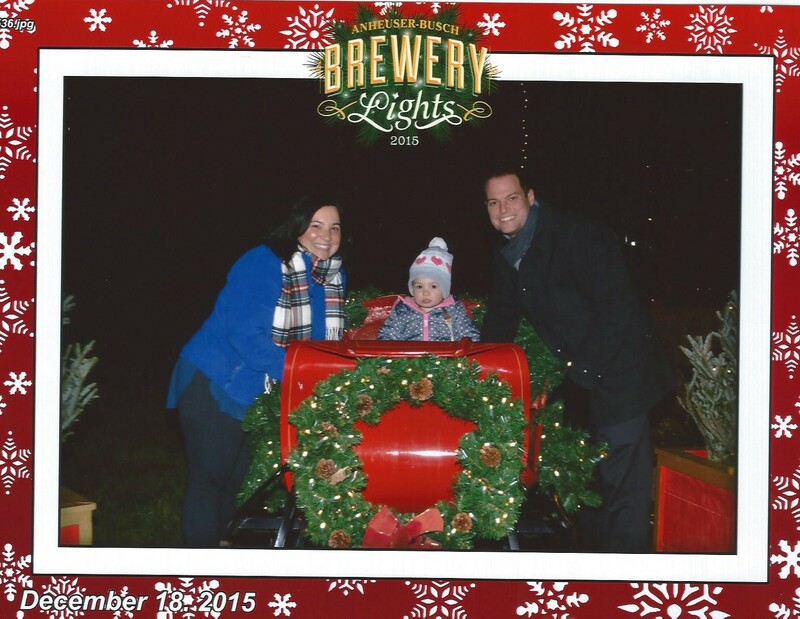 Disclosure – Thanks to AB for inviting us to experience the Brewery Lights. In no way did it influence my opinions – all my own and we had a ball! Yay for the brewery lights, one of our favorites! Oh how gorgeous! And fun. Great pictures.